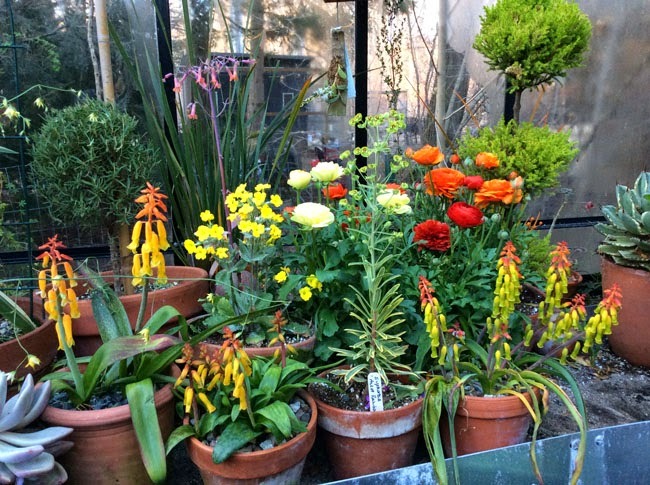 The back bench in the greenhouse full of early spring color, with Lachenalia, euphorbia and primula brightening up the a late afternoon in April after a rain shower. Finally, it's beginning to feel a bit like spring around here, as most of the snow has finally melted, and daytime temperatures reached 60º F for the first time on Sunday, which gave us our first day out in the garden. There is still snow in the shade, and along the north side of the house, but most of the garden has drained enough so that it officially is no longer mud season, allowing us to rake, dig in the raised beds and to basically clean up what we never were able to get to last fall due to painting our other house. To be honest, the garden is a complete mess, but even with one days work, the good part of the garden ( the part near the greenhouse) is at least raked, the old tomato plants collected and composted, and dog poop, dog toys and a random selection of missing footwear, canned goods and potato chip bags, along with more pens, cigarette lighters and gum packages that the corner store could ever own, have been recollected, thanks to four terriers and a doggie door. 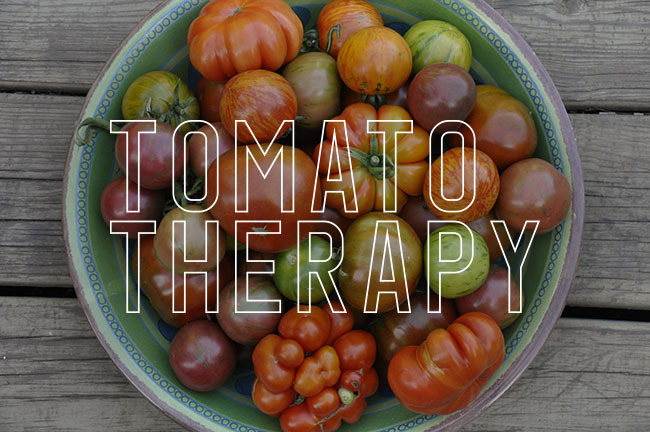 I've been also working on more videos, this time in the greenhouse, but I am not ready to share them yet. This was the weekend to focus on the outdoor garden. The beds were limed with horticultural grade ground limestone, turned in carefully with a pitch fork, and many seeds sown including two types of peas, beets, radishes, and onions. Plants which were ordered during the winter, are beginning to arrive - which makes every day a bit like Christmas, as we unwrap containers of this and that, often things that we forgot that we ordered. Tropaeolum speciosum reaching peak bloom in a pot, that I keep on the front bench of the greenhouse. The tuberous tropaeolum vines are reaching peak bloom, and I thought that I would include a few images of them here. Each year I am more and more impressed with these lesser, yet close relatives of the common nasturtium, which we all know and love in our annual gardens. The perennial vines which arrive from tubers no larger than a golf ball, amaze and surprise me every winter and spring as they emerge, and bloom their butts off. 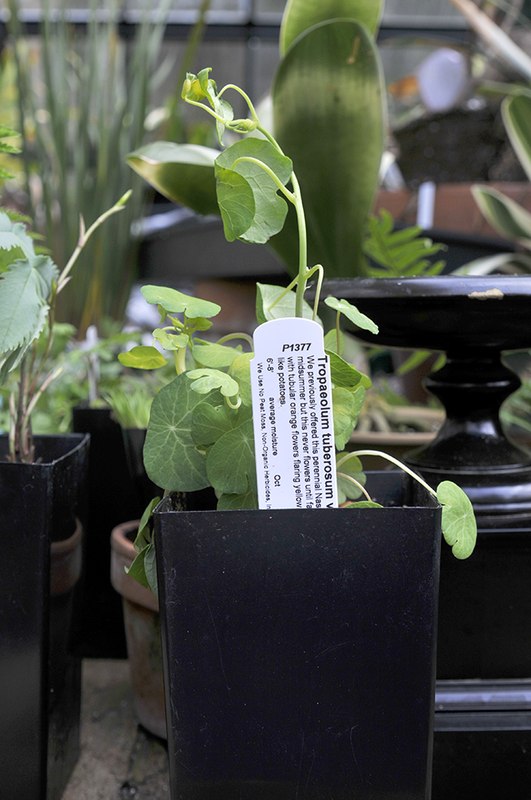 Some new Tropaeolum are arriving in the mail, too. This one, T. tuberous is a bit more common, but difficult to start. I was so happy to find a source that offered started tubers in 1 quart pots and not just a dormant tuber. These all came from my current favorite source for interesting plants, Far Reaches Farm. 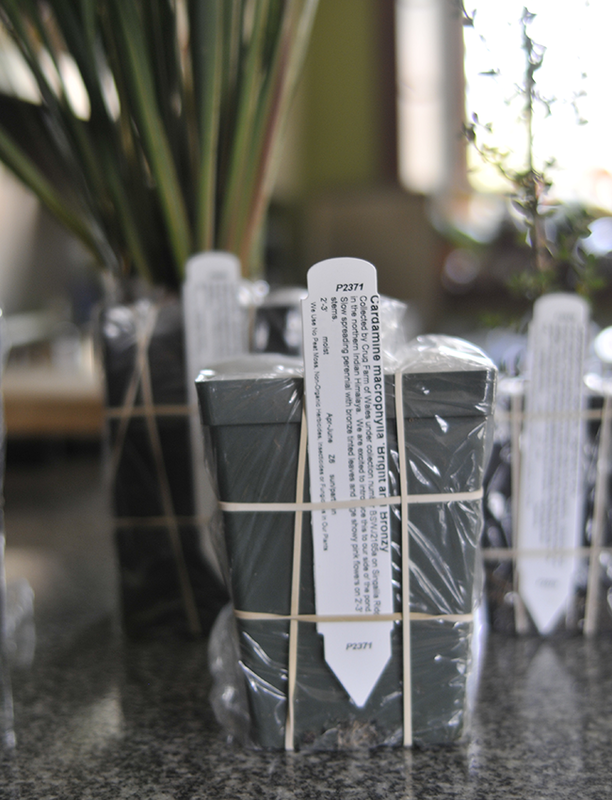 I am preparing my second order from FAR REACHES FARM, their plants come wrapped like this, sometimes dormant, or of a great size. Sue Milliken and Kelly Dodson truly have built a gem of a business, and I encourage everyone to check out their offerings - many plants found no where else, and most make excellent summer container plants. I think I ordered far too many types of seed this year! 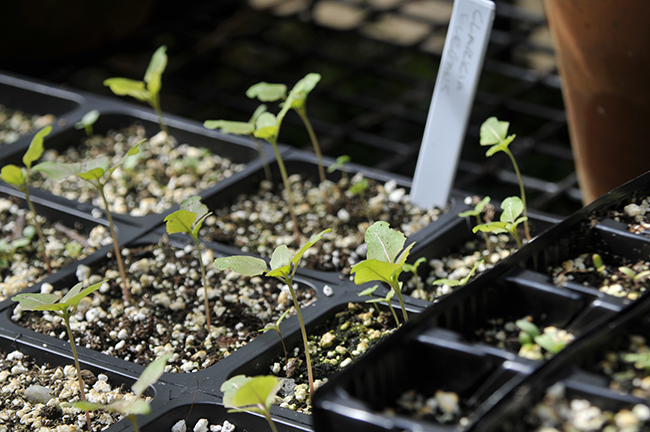 Where am I going to find time to sow them all, or even find a place to plant them all? 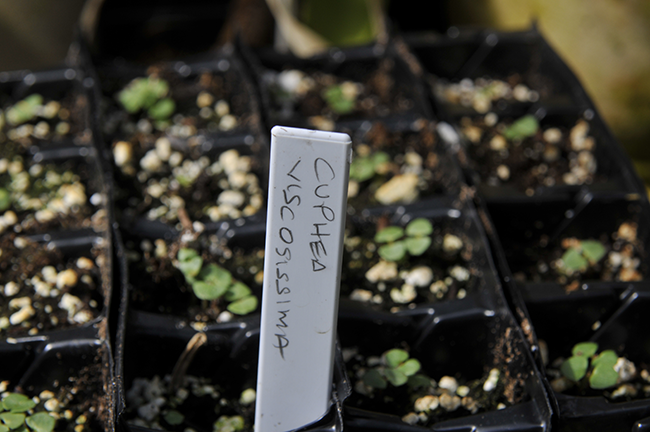 I am encouraged by some, such as this flat of Cuphea viscosissima, which I finally found a source for! Many difficult or 'fussy' annuals have been sown in individual cell containers ( these Clarkia elegans are a bit 'soft and tender', and are being placed outdoors to harden off). It's not all about flowers - I am using some old greenhouse flats in which to raise mesclun. These are large flats, 3 feet long from an old greenhouse, large enough to allow me to generously sow long rows of mesclun, that I can snip and bring into the kitchen in a few weeks. Thanks so much for the link to Far Reaches Farm. I followed the link and to my surprise and delight found the photo of Sue. I used to buy plants from her when she was in Vermont but had lost contact. 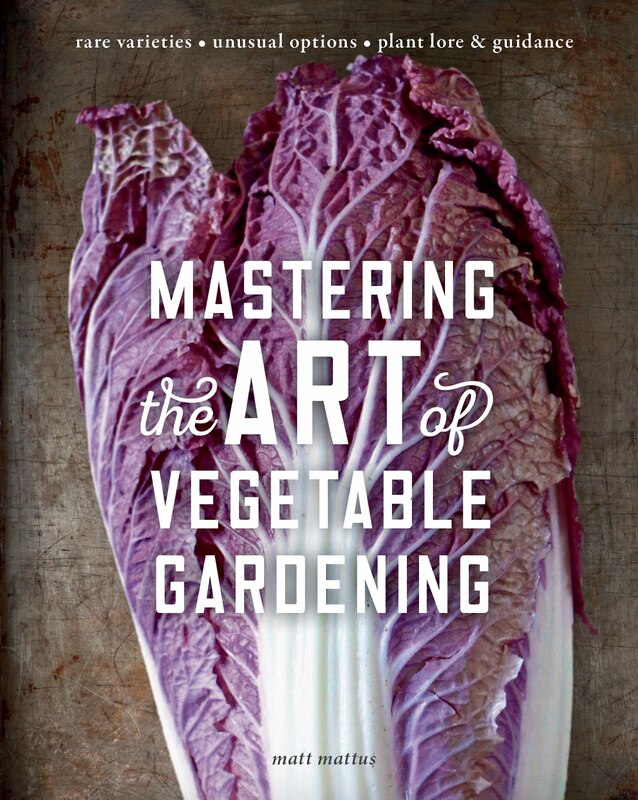 She was always a great resource with an encyclopedic knowledge of plants and I'm so pleased to know where she is now and to have the chance to reconnect. Interesting post. 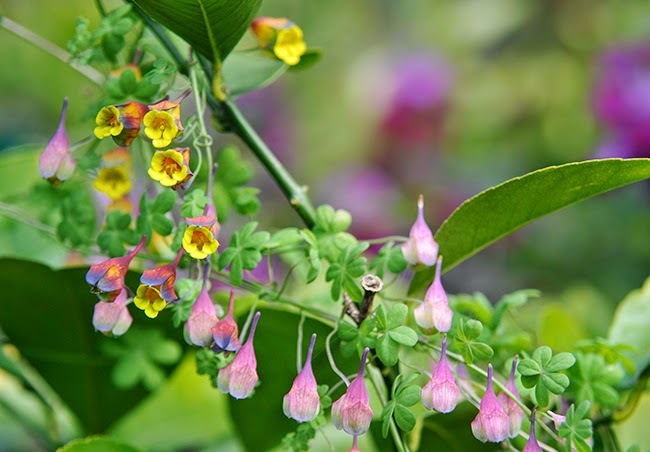 Sorry to tell you that the image of the Tropaeolum is not Tropaeolum Speciosum. 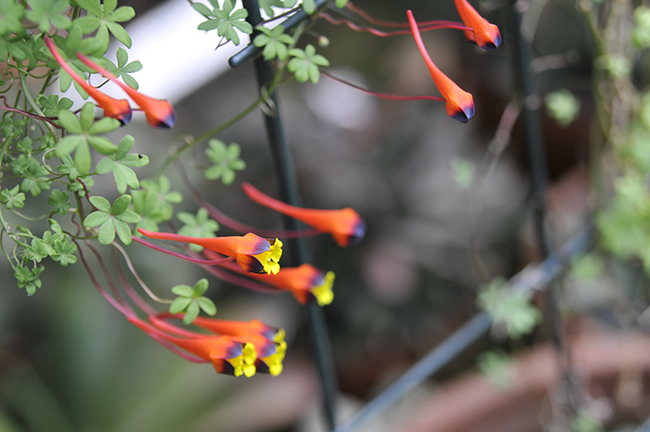 Tropaeolum Speciosum has a completely red flower followed by blue seeds. 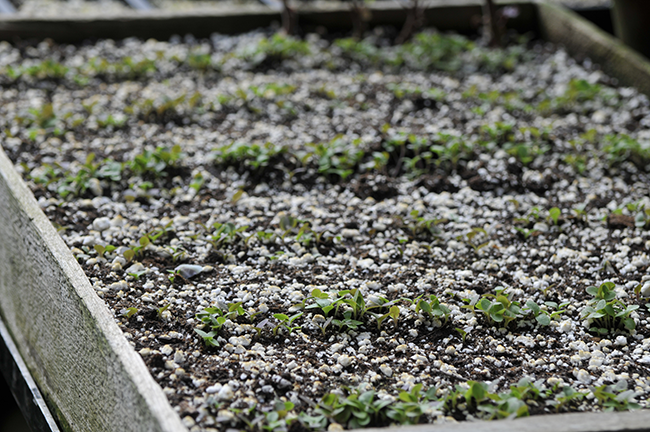 It will grow in pots in a greenhouse but is better growing outside through an evergreen conifer or large shrub. It is hardy in my garden to -16 and grows to about 4 yards high. Can be grown from seeds but is easier and quicker grown from the rhizome/root planted in the Spring. I know, you are correct. Don't know what I was thinking when I wrote that. Obviously it's T. tricolor - I've tried T. speciosum so many times here and have had no luck in wintering it over. Still trying, though! It's always a good thing to leave a comment!